The genus name, Ricinus means “dog tick” in Latin, because that is what the seeds look like. The Castor bean was originally native to northeastern Africa and the Middle East, but has gone wild and naturalized almost everywhere in the world that has a tropical or subtropical climate and is especially common in coastal areas. 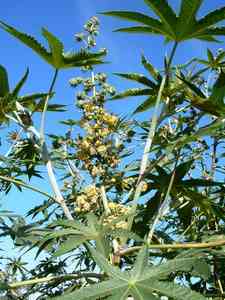 Castor bean grows wild on rocky hillsides, waste lands, fallow fields, along road shoulders and at the edges of cultivated lands. There are several cultivated varieties with strikingly different foliage colourations, including black-purplish, dark red-metallic, bronze-green, maroon, bright green with white veins, and just plain green. In cold climates it is an annual, growing quickly, setting many seeds, and dying off in winter. 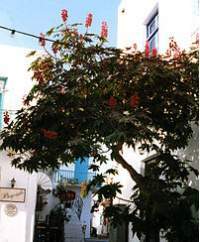 In mild winter areas, like ours, it is a long-lived perennial, sometimes reaching small tree size. Each plant produces hundreds of the bean-like seeds and these seeds can remain viable for more than a decade. 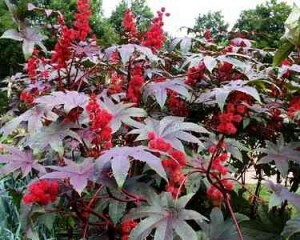 Castor bean is very easy to grow – too easy, some might say. They have a tendency to self sow and new seedlings can pop up all summer long. This is one of the fastest growing plants in the world and becomes almost treelike in 3-4 months. 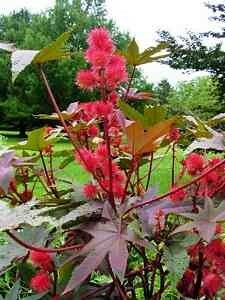 Castor bean plant spreads quickly because it has many built-in advantages over native plants. A very robust grower, its leaves are poisonous even to predatory insects. Aphids that can safely feed on many other poisonous plants quickly die after sucking the juice of castor bean leaves. But castor bean has one disadvantage. It is completely easy to recognize and can then be killed by chopping it down or spraying it with herbicides. Castor plant is beautiful, but the castor bean seeds contain ricin, one of the most poisonous naturally occurring chemicals known to man. Even very small doses can be fatal. I guess most of you know the story of the assassination of Georgi Markov, a dissident Bulgarian journalist. He died mysteriously while waiting for a bus near Waterloo Station in London, in 1978. The Scotland Yard postmortem revealed that Markov was murdered, shot in the leg with an umbrella rigged as a pellet gun. The perforated metallic pellet stuck in his leg was found to contain the deadly ricin toxin. 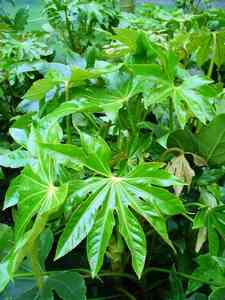 There is a great deal of concern about castor plants in gardens. The entire plant is toxic, but the beans particularly so. 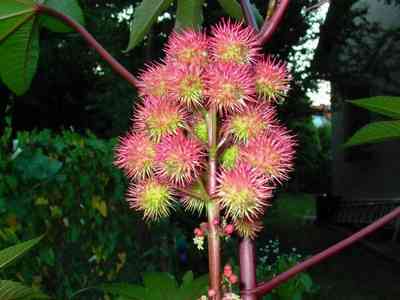 In light of the fact that just one milligram of ricin will kill an adult, it is best to leave castor bean seeds alone. The toxic seeds, however, also have many positive uses: Castor oil, derived from castor beans, is used extensively in medicine and in varnishes and paints, as a lubricant and lamp oil, and in many other industrial and manufacturing processes. The foul tasting laxative, castor oil, loathed by children everywhere, tastes poisonous but is a valuable purgative still widely used in modern medicine. Castor oil also is used externally to treat some kinds of skin diseases including ringworms and warts. 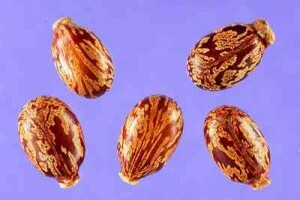 The seeds are also toxic to gophers. Old-time gardeners used to drop beans into the rodents’ holes to poison them. The planting of Castor bean plants around the perimeter of a garden was another way to discourage the pests. The seeds have long been an important source of oil famous for retaining viscosity at very high temperatures and is a major ingredient for Castrol racing oil. 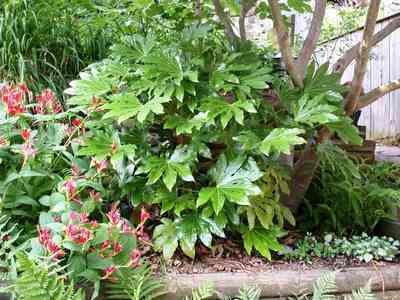 Castor is an extraordinary plant right in style with today’s foliage-centered gardens. The huge leaves are as suited to a Victorian garden as they are to modern tropical inspired looks. And if you follow the old practice of snipping off the flower stalks before seeds form, the plants are nearly risk-free. Most gardeners grow Castor bean plants in small groups as specimen plants to create a tropical look. This is a large, coarse textured plant that grows very fast in a single season to fill in a big area or serve as temporary landscaping or quick screening. In frost free areas they are grown in large borders or allowed to naturalize in the back of the landscape. 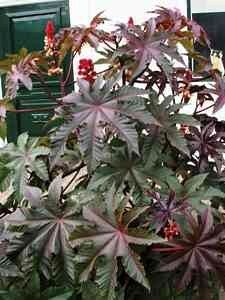 In frosty climates, the Castor bean plant is the best way to create a quick tropical effect. Many plants are poisonous to a degree, including many popular and commonly used landscaping plants. We can ban them from our own gardens, but will still encounter them in other gardens, parks, in the wild, etc. The best thing you can do to protect your children or grandchildren from accidental poisoning is to teach them to never ingest any plant parts unless first approved by an adult. If you like the exotic look of Castor bean plant, but want to avoid any poisonous plants in your garden, a safe alternative is “Fatsia japonica” (also known as false Castor bean plant). It looks almost similar, but is harmless. Huge bright green shiny leaves adorn this lovely thick-trunked Cretian form of the “Castor Oil Plant”. This is the quite rarely offered true wild form bearing dazzling bright red flower buds and seed pods amongst large dark green leaves. Spain Info castor bean plant San Francisco De Asis, Urb Marina, San Fulgencio, 03177, Alicante, Spain. 38n21, 0w29.